Learn extreme composting with worms. This can be composting in winter or in hot climates. You'll need an extreme vermicomposting guide and I've got your extreme connection. 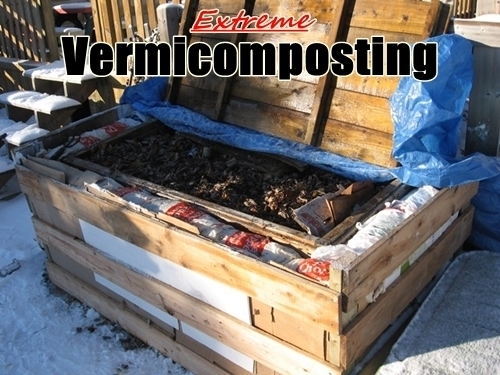 The Extreme Vermicomposting Guide involves composting with worms in extreme climatic conditions. As many more people understand the importance of working with nature instead of against it, they find themselves becoming more fascinated and involved with different ways to harness it's power. This means they'll want to maintain and multiply their success exponentially, but there's only one problem...Nature happens. That's Right! What was responsible for success can also be responsible for failure if we don't work with it and be prepared for it. Worms and the climate are perfectly natural, but trying to grow and maintain a thriving worm community in harsh conditions is completely a man-made (albeit, nature-inspired) desire. Composting in winter has it's challenges and the Extreme Vermicomposting Guide not only has answers, but a community of extreme help. Not only will you be reading the Extreme Vermicomposting Guide, but you'll have access to a community of other extreme composting enthusiasts to glean from. You'll get instant access to a private Facebook group where you can get answers to some of the most extreme questions. Many of them you never even thought to ask, but will eventually deal with during your extreme vermicomposting ventures. Maybe some of you never thought of using some of your indoor worms for winter composting for fear of losing them. All you really need is some rock solid education with proven results and a little mentoring along the way. Here is what you'll get! All For a One-Time Low Price!